Formula One has come to Belfast once again. 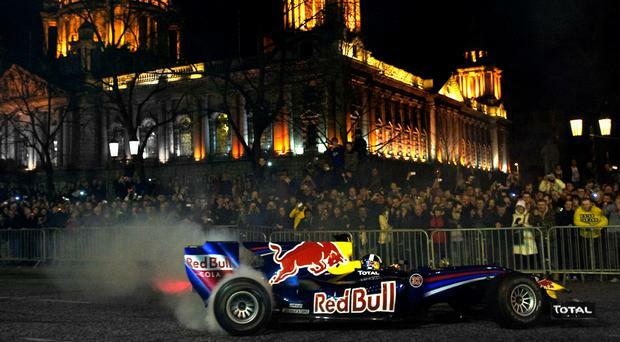 Formula One is set to come to Belfast once again. David Coulthard and the Red Bull racing team will be the star attraction in Belfast on Saturday night as they bring their championship-winning Formula One car to City Hall. Starting at 8pm, with three public viewing slots held at half hour intervals, fans will be able to see the famous car perform donuts, burnouts and speed stretches in front of the iconic building. The car will also be on public display from 12pm in the afternoon until 5pm. Scottish legend David Coulthard, who won 13 Grand Prix as a driver with Williams and McLaren, will be joined at the event by local motorcycle stars Jeremy McWilliams and Ryan Farquhar. Also in attendance will be two lesser known lights in the shape of Galway stunt bike rider Mattie Griffin and Cork's Conor Shanahan, a drift champion and a Red Bull athlete. Coulthard himself will be driving the Formula One car, which he raced during the final years of his career, while the motorcyclists will be performing jaw-dropping tricks as well. McWilliams will be riding one of Farquhar's KMR Kawasaki Supertwin motorbikes at the event, the vehicles being put through their paces around Donegall Square, with all five motorsport experts set to wow the crowd with their abilities. "They're absolutely the best thing you've ever heard. It'll set the city alight!" claims McWilliams. "They're pure adrenaline, they're something special. I think that's what'll make the event so special as well. The sound of the 650b turbo twin exhaust will sound great bouncing off the city walls."